Our organic and free range Duck are bred for health and quality. They eat a healthy diet and roam completely freely on acres of pasture. Healthy, happy organic and free range ducks means nutritious, delicious food for you. Give your Christmas a little added quality this year with an amazing free range organic duck. 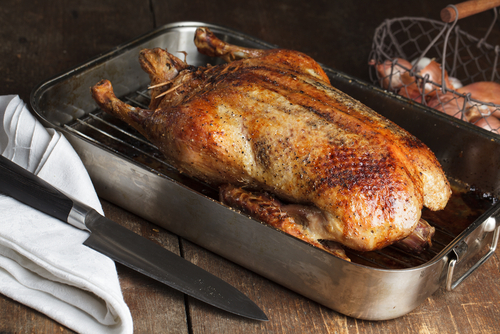 The free range organic ducks are juicy and tender they will make any Christmas dinner a success! The ducks are of the Ayrshire breed and from the Childhay organic farm in Dorset. TOP TIP: When cooking duck raise from the pan onto a rack (Maybe use the toasting pan from your grill) this allows all the fat to run away and the duck to go crispy outside.